Make a gift that will secure your legacy as a Culture Warrior. A will is a legal document specifying your wishes regarding the disposal of your property after death. After assuring your family’s financial security, you can make gifts to TMLC from residual funds. 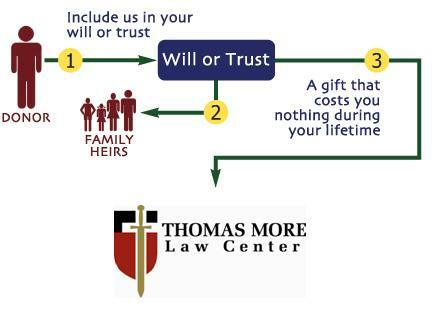 By including a bequest in your will (cash, property, or a share of the estate residue), you can make a gift to the Thomas More Law Center that costs you nothing during your lifetime. A bequest is simple to make and it’s easy to revoke if your situation changes. Residuary bequest: stated as a percentage. Example: ____% of my estate. Specific bequest: stated as a fixed dollar amount. Example: the sum of $___________. Expressing your bequests as a percentage of your estate is often simpler. In the event your estate changes in value, you may not have to update your will as frequently–thus, your gifts remain proportional to your estate. The Thomas More Law Center is a 501(c)(3) organization, and is primarily involved in litigation, education and related activities. All contributions and bequests made to the Thomas More Law Center are tax-deductible. The Thomas More Law Center maintains relationships with qualified estate planners, tax consultants, and charitable gift consultants. If you have any questions about how to effectively make a planned gift, TMLC will be pleased to assist you. Please contact our offices at 734-827-2001, or by e-mail at tlynch@thomasmore.org. The Thomas More Law Center is not engaged in providing estate or tax advice services. The purpose of the above information is to provide general information that might be helpful in considering a planned gift. The information provided should not be substituted for the advice from a qualified tax attorney or estate planner.